The Headshoe offers a quick escape for the tired eyes and busy minds of the Computer Age. SANTA FE, N.M. - Oct. 27, 2017 - PRLog -- The Headshoe company wants to make relaxation and mental self-improvement techniques easier by reducing three major sources of distraction with one convenient tool. 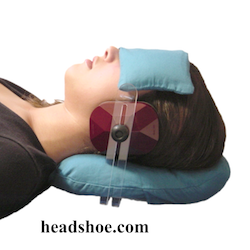 The Headshoe combines an eye cover and ear cups with a headrest to reduce light, noise, and physical stimulation at the same time. Unwanted distractions can limit relaxation and interrupt concentration and visualization. Closing the doors and windows can help but the Headshoe can add an extra level of peace and quiet for stress management, meditation, self hypnosis, or power naps. It won't provide the sensory deprivation of a floatation tank but it fits in a suitcase or backpack. - Reduces headache, fatigue, and insomnia. Whether at home, the office, or on the road, the Headshoe offers a more calm predictable environment to help trigger deep states relaxation and get the most out of a quick break. As a tool for wellness workshops and preventive healthcare strategies it may reduce the time and discipline needed for encouraging results. And professional athletes and weekend golfers alike are improving their performance using mental techniques that may be more effective with a Headshoe. The Headshoe is designed for use on firm flat surfaces. The head rest keeps the user's head low and back relatively straight and can be shaped for personal comfort. The flax seed eye cover molds to the user's face to block light without a strap. The simple ear cup mechanism attaches to a plastic base under the pillow and allows a full range of quick angle and pressure adjustment without tools. The ear cups slide up and down and in and out as needed. The ear cups won't block all noise but what gets through is muffled easier to ignore. Important sounds, instructional tapes, or live voices can be heard if loud enough or with the ear cups pulled out. The ear cups are maroon. The headrest and eye pillow covers are washable and available in blue and black. The Headshoe can be ordered from http://www.headshoe.com at an introductory price of $74.95 with free shipping in the US.